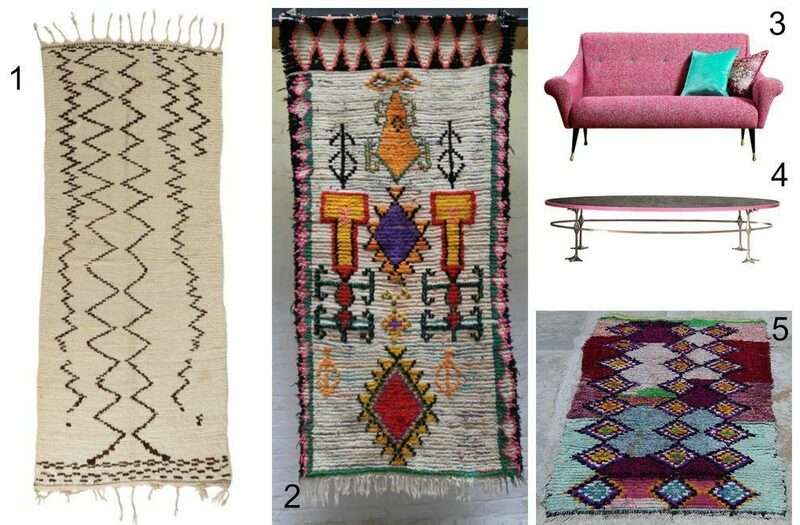 Today we’re looking at ways to bring colour and pattern to a room – mostly via rugs! 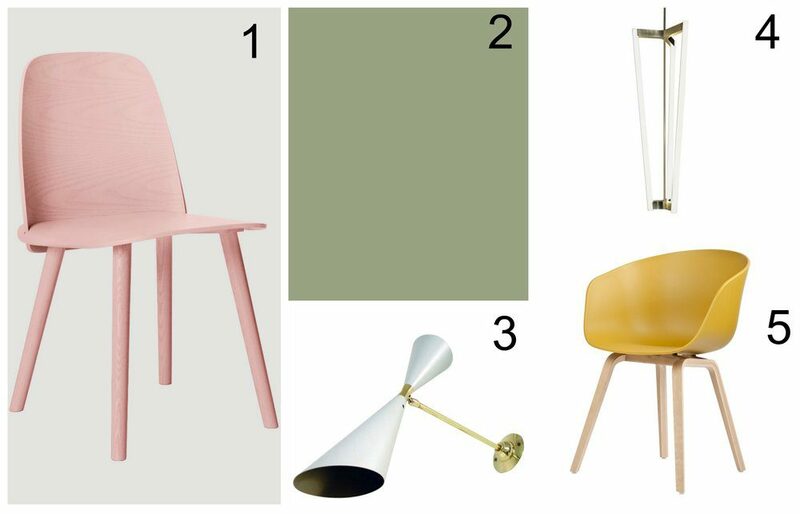 We found that the images we were drawn to fell easily into two different categories: bold and true colours versus muted, faded tones. Which do you prefer for your home? When it comes to adding pattern to a room, you want to keep things looking cohesive, but try approaching pattern in the same way as you would furniture – mix it up a bit to give the overall look more dimensions and much more interest. 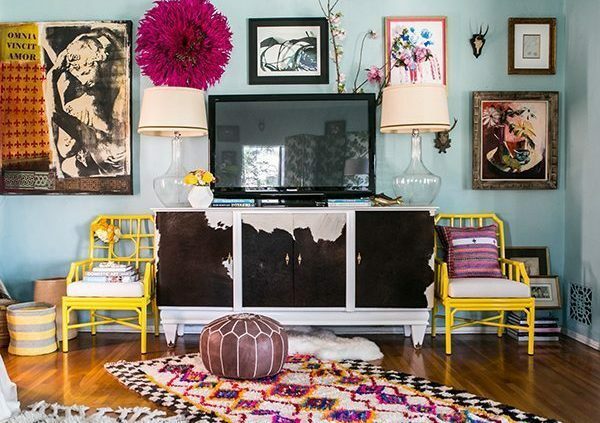 The easiest way to do this is to stay within a particular style – whether florals, geometrics or anything else. Or to start small by adding a few patterned cushions, blankets and decorative ceramics. 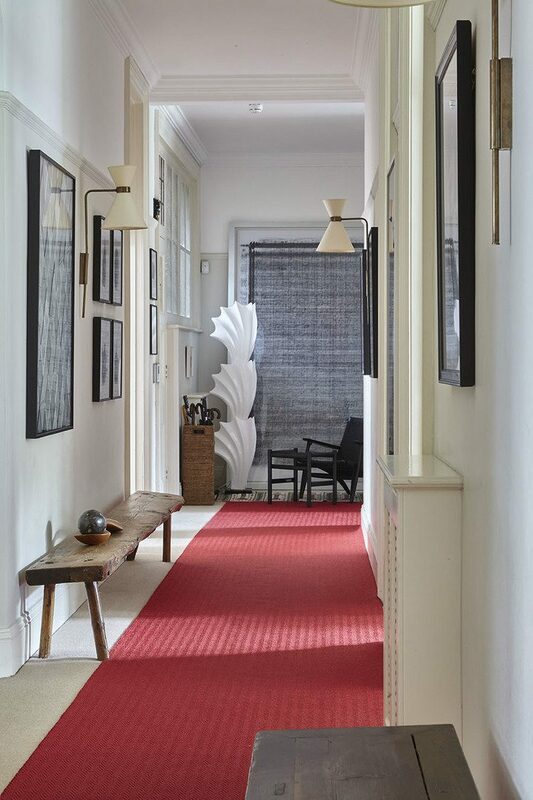 To go for more impact use rugs to bring pattern into play. 1. Have points of continuity even in a mixed-up room. 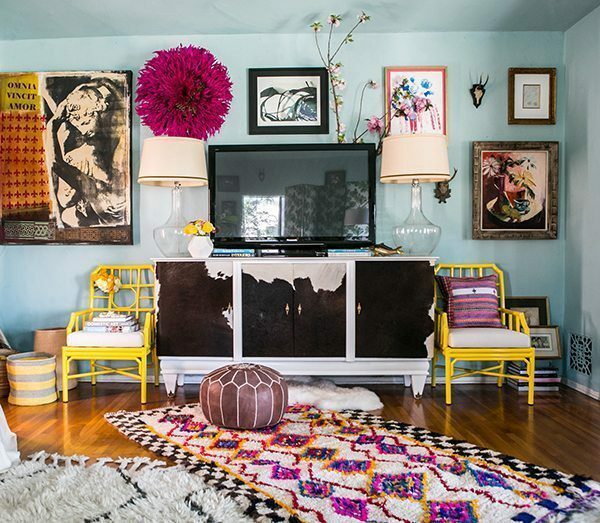 Styled by Dee Murphy, this living room includes a concoction of furniture and textile styles, and plenty of colour too. 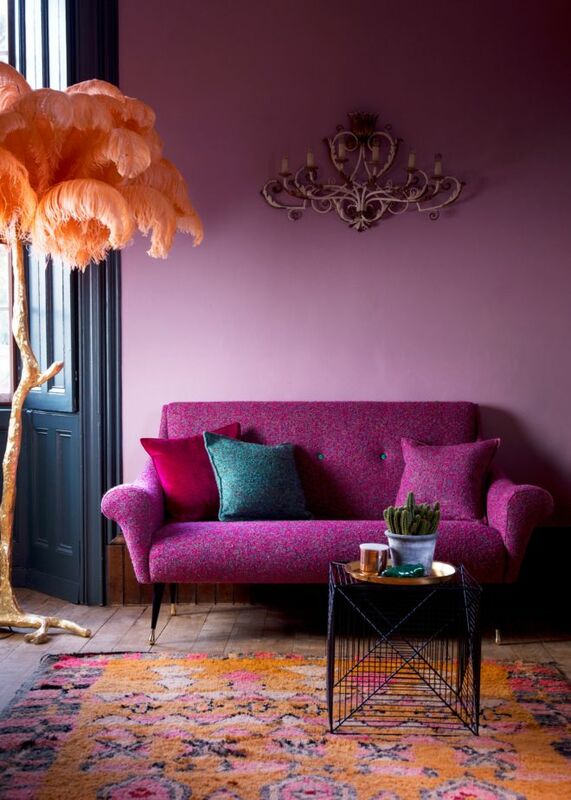 But there are points of continuity in it – for instance, fuchsia pink appears on the rug, the cushion and in the gallery wall helping to lead your eye around the room. If you picture this room without the layered rugs, even though it is quite colourful, it would be far flatter and definitely less cosy. 2. Use varying shades of the same colour. The rooms above and below are both less hectic than the first room, and are both from the Matthew Williamson collection. Above features really just three colours – 70% is pink, with around 15% orange and 15% blue. The rug was one of ours! We sold it many years ago, so it’s nice to see it crop up in such a lovely living room design. Below the tone of the room is set by cool blue- and the blue-on-blue effect of the glassware next to the wall works really well. 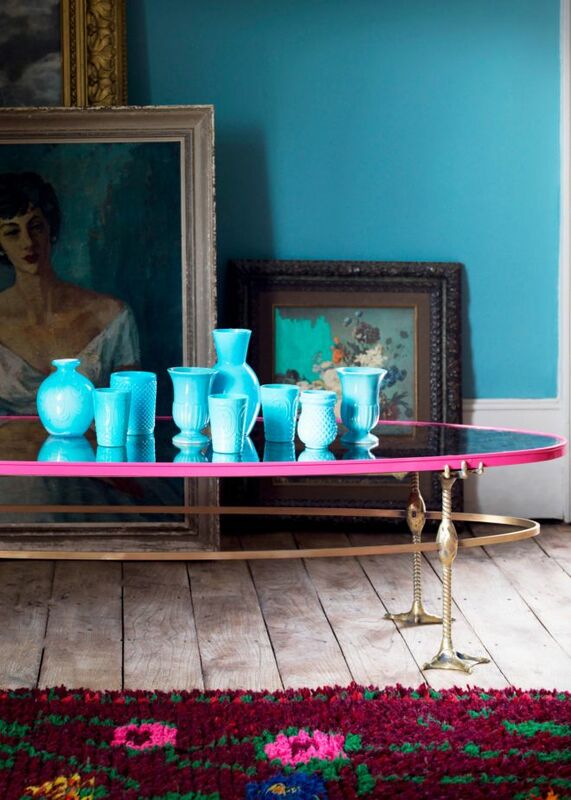 The look is then warmed up by hotter shades of blush, pink and red from the table and the rug. 3. When mixing patterns, find something to unite them – a repeated colour or element in the design, whether it’s that there are stripes or geometric shapes present. In this child’s room, a soft red appears on the chair, rug, quilt and even the dolls! 4. 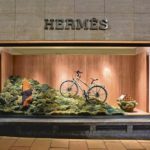 Use size and play with scale to make a feature. In this dining room by designer Christien Starkenburg of Studio Interieur+, there are a few soft contrasting colours going on – all quite quietly combined. 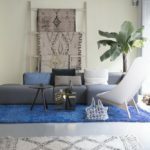 But the big design feature is the oversized blue kilim rug that sits beneath not just the table, but all of the chairs too. 5. 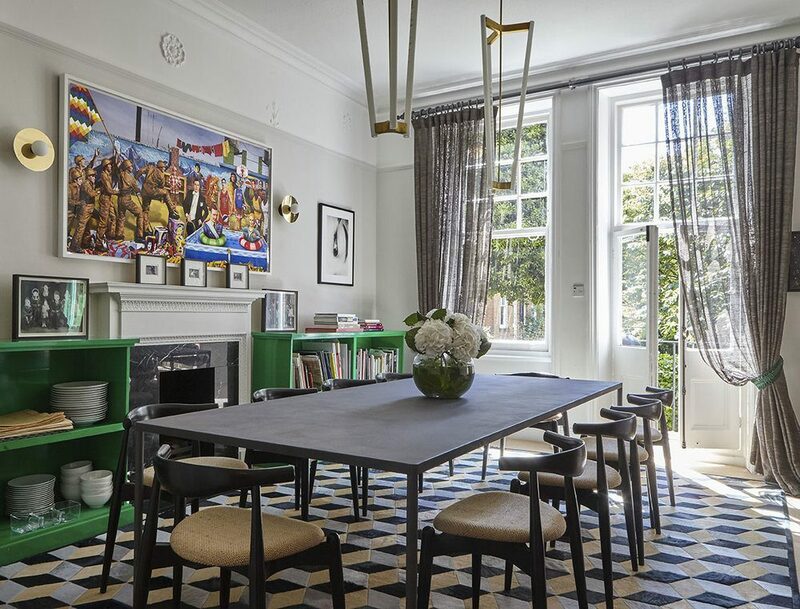 The same concept appears in the work of designer Fiona Squires (below)- this dining room features a huge rug that stretches well beyond the table and chairs, reaching to the outer edges of the room. Apart from the vibrant painting on the wall, it’s the only piece of major pattern in the scheme. 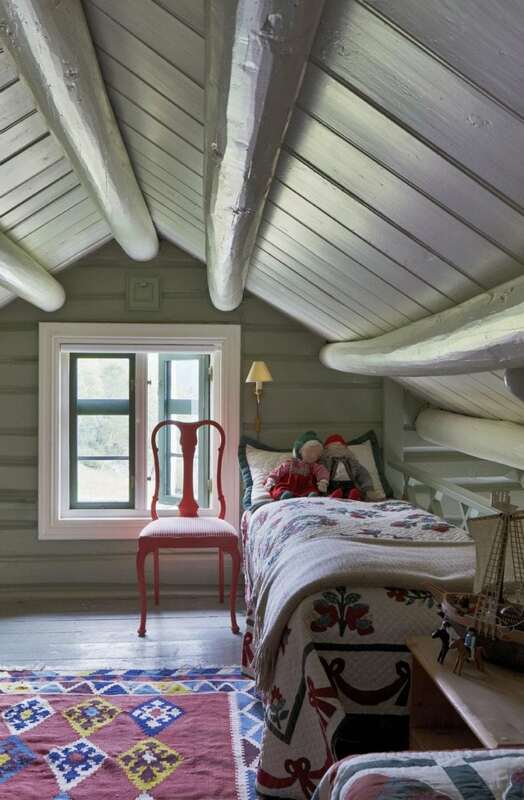 Because it follows the palette of the room, it’s a beautiful rather than overpowering addition. 6. Don’t use high contrast if you’re trying to create a classic room in a muted palette. The hallway below, also by Fiona Squires, features at its basis, a palette of very soft whites and off-whites with elements of rustic wood. This allows the red rug to really wow. But beware, Fiona has chosen a soft faded red that’s in keeping with her soothing design, rather than a jarring pillar box red that would feel out of place.